"Colin Nishida does great things at his establishment. The atmosphere here is relaxed and it's the perfect local hangout spot. The pork chops are a local favorite. The grilled ika, or dried cuttlefish, is another old-school ‘chaser’ and one of my favorites. It’s a perfect drinking snack, but it's hard to come by." "Growing up with a Filipino stepfather, all of Elena's food reminds me of my childhood. My favorite item on their menu is their lechon kawali, or crispy roast pork salad. The skin is roasted to a crisp, reminiscent of pork rinds." 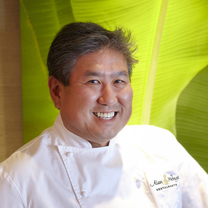 "Gaku uses fresh ingredients to create tasty dishes in an intimate setting. I particularly love ordering the chef's tasting, or omakase, which allows you to try many different items in one sitting. I also like their sushi and izakaya-style dishes, which are similar to a Japanese form of 'tapas,' or smaller plates." "Sheldon Simeon is a refreshingly contemporary chef that utilizes his Filipino upbringing in his food while also featuring local ingredients. His 'Hapa ramen' is a personal favorite." "I really like what Vikram does to impart Indian flavors from his heritage in Hawaiian regional cuisine. I also love his use of local ingredients. All of the hotel’s restaurants and menus reflect his philosophy and style, but I especially like going to Table One. It's an exclusive reservation-only seating for a maximum party of six. This is a private area, where chef Vikram Garg has total control of the entire menu that is always changing, therefore I cannot pick a specific dish. It is all good." "Everything on the menu is fantastic, so it's hard to choose just one favorite. However, I especially enjoy their fresh fish dishes. Roy is a champion of supporting local farmers and agriculture. His menu is also always changing since he gives opportunities to his chefs to showcase their styles, allowing his guests to try different dishes and flavors. You can't go wrong with his fish dishes. The service is spectacular, too." local whole Tomato Salad, served with a Li Hing Mui Ume Vinaigrette. "Our local whole Tomato Salad, served with a Li Hing Mui Ume Vinaigrette." "SWEET LAND FARM AND HAWAII ISLAND GOAT DAIRY CHEESES, ROASTED BEETS Walnuts, Arugula, Orange, Pomegranate Molasses Dressing"
"Seafood Stew with Keahole Lobster, Clams and North Shore Tilapia is part of our new Four Course menu, available nightly." "DRY AGED MAKAWELI RIB STEAK Kualoa Farm Ulu, Garlic Crimini Mushrooms, Cipollini Onions, Veal Jus"
"Butter Poached Big Island Keahole Lobster." "CHOPPED AHI SASHIMI AND AVOCADO SALSA STACK Stacked on Crispy Won Ton, Spicy Aioli, Wasabi Soy"